Ebd123.com might look like a fun search tool, but our researchers identify it as an unreliable and potentially malicious browser hijacker. Even if you have installed this search provider willingly, it can be identified as a hijacker because it has the ability to change browser settings without permission. Needless to say, this is one of the reasons why you need to delete this infection from your operating system. If you continue reading our report, you will find even more reasons to remove Ebd123.com from your browsers. If you are not interested in learning about this threat, you can move straight to the removal guide below. Our researchers have found that Ebd123.com was registered by Chang Li. What is more, this search tool provides links associated with hao123.com, which is another browser hijacker that requires immediate removal. 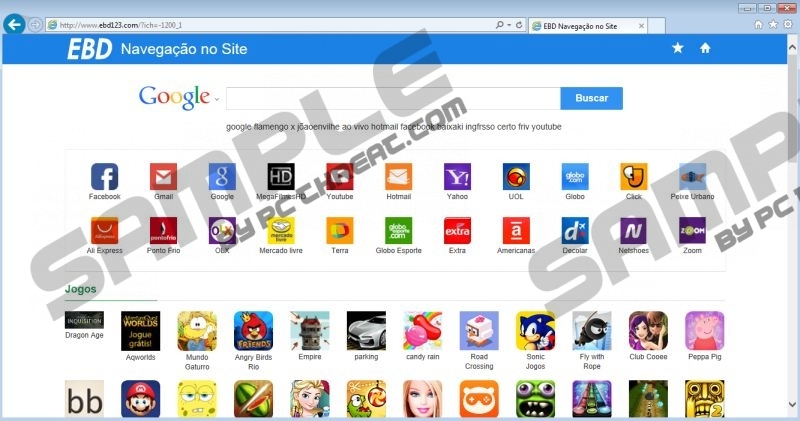 Although it might seem that Ebd123.com is a Chinese hijacker, in reality, it is targeted at users in Brazil. It is highly likely that your IP address will be read beforehand to know which hijacker to unleash, and it is possible that many different versions of this hijacker exist. Regardless of where you live, you need to delete unfamiliar, uninvited hijackers, as well as search tools that are unreliable. Although Ebd123.com appears to represent Google search, you will be exposed to customized Google search (Google Custom Search) that is likely to represent sponsored links and potentially unreliable advertisements. Needless to say, the fact that Ebd123.com does not work as a regular search provider is another good reason to delete it from your web browsers. Unfortunately, many users are convinced that the search results are trustworthy. What is more, the hijacker provides offers services that computer users are attracted to. Of course, we believe that you should remove this infection instead of using it. It is unlikely that you will get rid of Ebd123.com unless you change the Target settings. If you follow the guide below, you will fix the Target and replace the unwanted search tools in no time. We strongly recommend using reliable, automatic malware detection and removal software as well. Because the hijacker could travel bundled with more malicious infections, you have to make sure that they are deleted as well. On top of that, even if you remove Ebd123.com successfully, your virtual security will remain vulnerable unless you implement reliable security software. Locate the browser shortcut infected by the hijacker and right-click it. Select Properties, click the Shortcut tab, and navigate to Target. Remove the URL after chrome.exe”/firefox.exe”/iexplore.exe” and click OK. Launch Chrome, tap Alt+F, and select Settings. Move to On Startup and select Open a specific page or set of pages. Click Set pages and change/delete the URL of the undesirable search tool. Move to Appearance, mark Show Home button, and click Change. Overwrite/delete the URL of the unreliable search tool and click OK. Choose the desired search tool, remove (click X) the undesirable, and click Done. Launch Firefox, tap Alt+T. and click Options. In the menu on the left click General and find the Home Page. Overwrite/remove the URL of the undesirable search provider. In the menu on the left click Search and select the preferred search provider. Select the undesirable search provider and click the Remove button. Launch IE, tap Alt+T, and select Manage Add-ons. Move to Search Providers and select the preferred search provider. Select the undesirable search provider, click Remove, and click Close. Tap Alt+T one more time and select Internet Options. Overwrite/delete the URL of the undesirable search tool and click OK.
Quick & tested solution for Ebd123.com removal.